Sinuous is a Grand Rapids, Michigan company that crafts unique, high quality sculpted guitars for the most creative and discerning players. Our guitars are designed for the innovative and image conscious guitarist who demands authenticity, craftsmanship, and an instrument that is truly special. Through our use of innovative design and manufacturing techniques, our guitars have improved the ergonomics that strengthen the intimate relationship between musician and instrument. 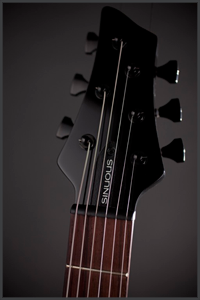 Innovative musicians have always inspired us in everything we do and our Sinuous guitar is our gift back.